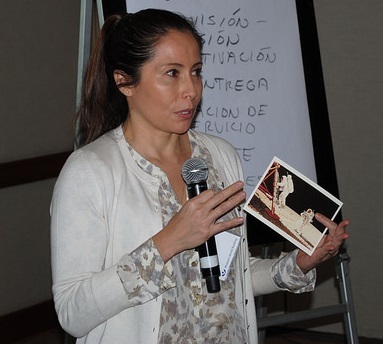 Last March, I had the amazing opportunity to attend the Women in Leadership training in Mexico City. It was an eye-opening experience in many ways. I met incredible women from all over Latin America, who over the course of the week shared experiences, insights and above all, inspired me with their strength and humility. The training was a priceless opportunity to take some distance from our daily activities and create a much needed space for personal exploration and self-reflection. At the end, all of the participants left re-energized and with a renewed commitment to continue improving as professionals, as members of our communities and as leaders. Before the training, I used to think of a leader as someone who was in a position of power or authority over other people, but during the training I learned that a leader is simply “someone who has followers.” I had mistakenly applied the definition of supervisor or manager to the concept of leader, narrowing my understanding of something that was actually much broader. This insight completely changed how I thought about leadership. This means that each and every one of us—regardless of the position we occupy in the corporate hierarchy or the title on our business card—can be a leader, as long as we can effect change on the behavior, thoughts and reactions of other people. How empowering is that idea? Instead of passively waiting for the authority to be bestowed upon us by some higher power, just developing exercising and our leadership within our circle of influence already makes us leaders; formal recognition will come later. We’ve all heard of tailoring your message to your audience. But during the training, we were introduced to another concept—of tailoring not just what you say, but how you say it as well. The most effective way to communicate with someone is using the style preferred by that person. For example, I would like to tell my manager—someone who prefers quantitative and analytical data in order to make decisions—that one of my projects needs additional resources to be completed on time. If she needs facts and figures in order to better process the information, I should not go into the conversation with an abstract message about how we are lacking resources and need more. I should come in with a clear explanation of the resource gaps and the assets we need to fill that gap, and even provide a comparison of the funding available to projects similar to mine so she can have the complete picture. Learning how the people we interact with prefer to communicate allows us to identify the best way to convey our ideas and tailor our delivery to their needs and preferences. There are lots of other situations where we can successfully apply different communication style, when we are when negotiating for instance. Negotiation is an interesting one because it is something we do everyday although often we don’t realize we are doing it: we negotiate as consumers trying to get the best price, as parents trying to get our children to so what we want, as employees trying to coordinate work or vacation time with our employers or colleagues. Many of the most influential leaders are people who not only have a strong vision and a passion for an idea, but also the capacity to transmit that passion and inspire others in a way that allows the message to get through to their different audiences. Without exception, the women I met at the leadership training had been through very tough times, both professionally and personally. Many had to overcome great obstacles in order to climb the corporate ladder and further their professional careers. Many of them were still struggling to keep a balance between work and family. 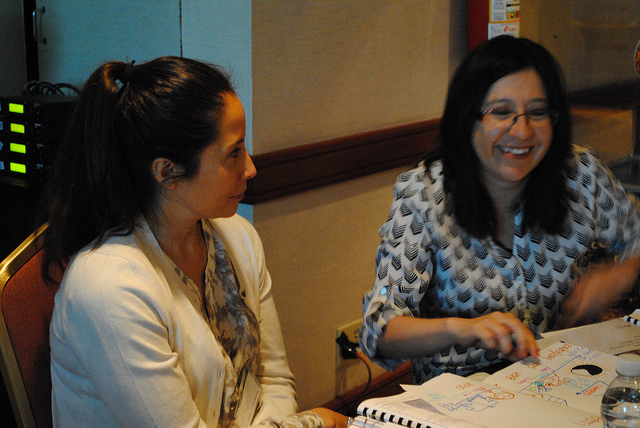 One of the most impactful exercises we did was drawing our “leadership vision:” we looked at our past trajectory and attempted to project our goals into the future. Instead of thinking about difficulties and obstacles we had to overcome as ‘baggage’ that weighs us down, I learned to think about these as ‘wins’ that have allowed me to be stronger and also made me realize and celebrate how much I’ve already accomplished. Meeting those remarkable women was an honor and a deep, deep privilege. I plan to keep in touch with them as a source of support and inspiration and to support and inspire them as well. They already are part of my leadership vision as role models of what real women leaders are like and their powerful success stories give me the energy and courage to continue fighting to achieve my own vision! Participating in this program has taught me valuable lessons and has allowed me to understand my personal experience as something to draw strength from. Learning to adapt my communication style to my audience is a lesson that can be applied to absolutely every aspect of life. But the redefinition of leadership is perhaps the biggest thing I took home. I look forward to interacting with my world in a new way, not only paying attention to, but also taking every opportunity, big or small, to exercise and strengthen my “leadership muscle”. Ines was a member of the first class of Women’s World Banking Fellows. She completed her two-year Fellowship at Women’s World Banking in the summer of 2014 and is currently working for a local microfinance organization serving entrepreneurs in New York City.